The only place to rekindle the spirit of a stressed woman is the salon. 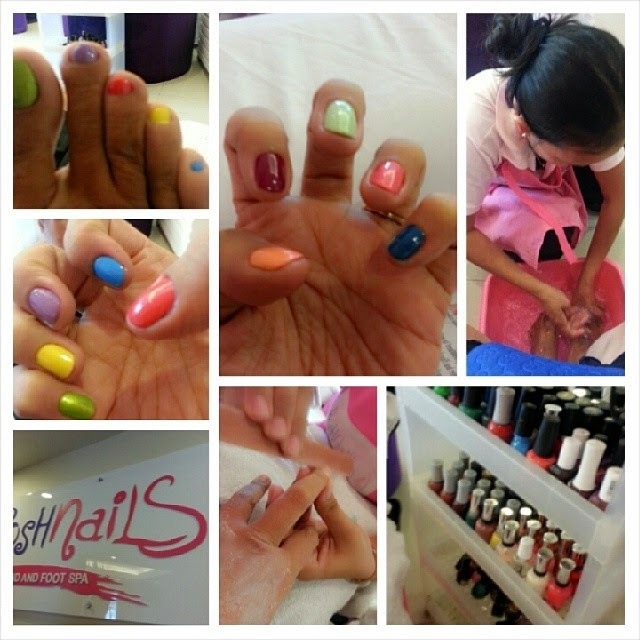 Today was a wonderful Posh Pampering Day at Posh Nails Connecticut Greenhills San Juan. Located at the 2nd floor of Fox Square Building (where Bikram Yoga Greenhills is), Posh Nails is the new baby of two beautiful gorgeous ladies Ms. Diane and Ms. Kristine (yuppies taking their passion to business). 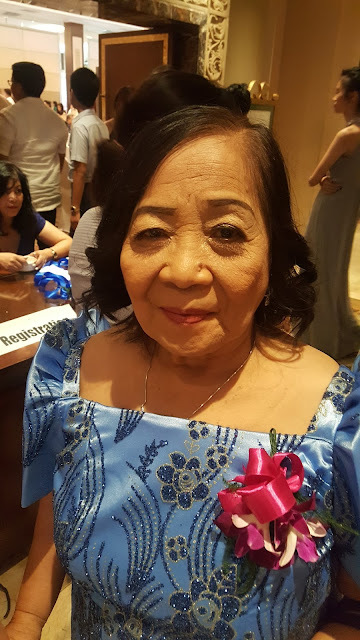 A beautiful lady with such beautiful smile (Ms. Kristine) greeted me and showed me the new service Posh Nails offers - Italian Mandarin. The themed manicure pedicure service dubbed Italian Mandarin may sound odd but it is a combined service of scented scrub and wrap sure to bring anyone to bliss. So, I sat in their dainty comfy chair with such colorful and clean pillows. In seconds, the ladies approached me with their tools and gadgets. My feet was first soaked into warm bath with bubbles. Apparently, so many women had frequent this Posh Nails branch because of their Margarita or strawberry-scented water. The ladies were courteous and would not bother any guests of small chitchats unless provoked. The tacky me would just not pass the chance to interview them of life, love and romance and in a matter of minutes all the other guests were also laughing at my knacks. If you're into relaxation, you'd hear those whispers of chat in any salon and those sometimes, get to be the word-of-mouth up to the ends of the world. 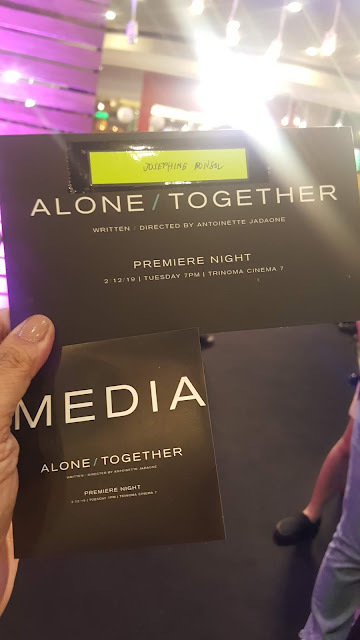 After all, single independent women like us would not pass the opportunity to vent in places like these because the ladies were just trustful and friendly. A few minutes of discussing celebrities, my feet was then soaked and washed off for the next service, the Italian Mandarin Scrub. Another therapist sashayed with tools on my side to get my nails ready. Without having to disturb my frequent use of my mobile phone posting these photos, they were both able to scrub my whole leg and whole arms at ease. Up to the moment they were rinsing it off to apply the mask, I was almost dozing off while reading posts on my Facebook wall. We continued chatting about their lives and how they have learned to love nails and their job. Amazing how I was so unaware they got my hands and feet done in a breeze without frills. These ninja moves of the ladies slowly took me to heaven. It was that smell of citrusy summer lotion and mask refreshing to the skin making me feel I'm back to my youth. The ladies were so careful not to stain my clothes or get my pants wet even with my constant movement and laughter. The final step of getting my hands and feet wrapped in Italian Mandarin Mask was just too relaxing, I dozed off a bit. 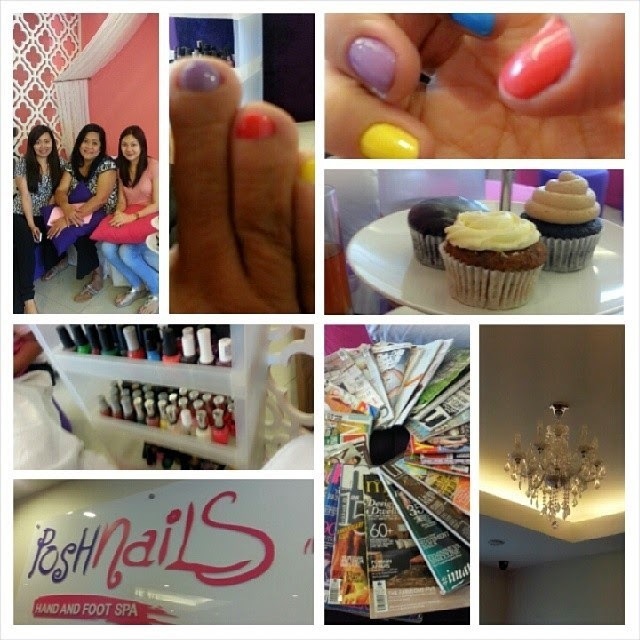 Posh Nails had trained their staff so well on making every woman feel good in their salon. They were discreet of attending to every customer's needs and I've never felt them talk to each other or use their mobile phones at work which some customers complain in other shops. I've witnessed their patrons know particularly the names of each therapist and every customer who visits the shop the first time leaves with a big smile on their faces. 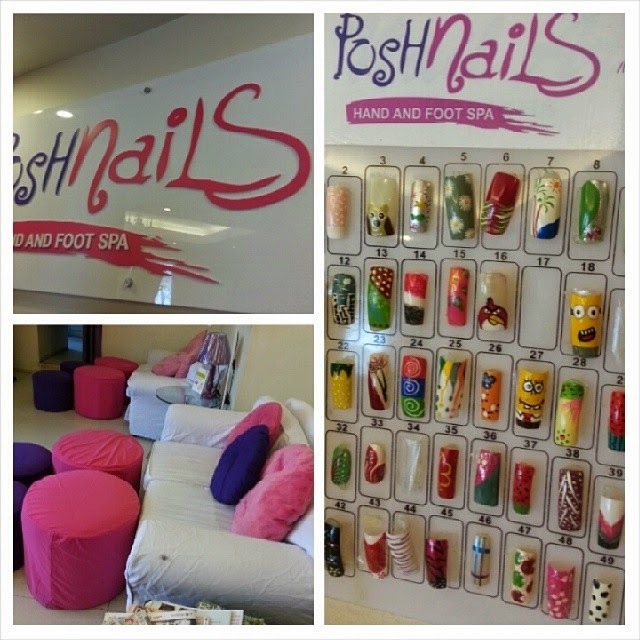 It's a happy Posh Nails salon and no wonder this place will soon be a hole in the wall in Greenhills. And they're ready for Sparty Packages even if the space can only accommodate 15 pax at max. 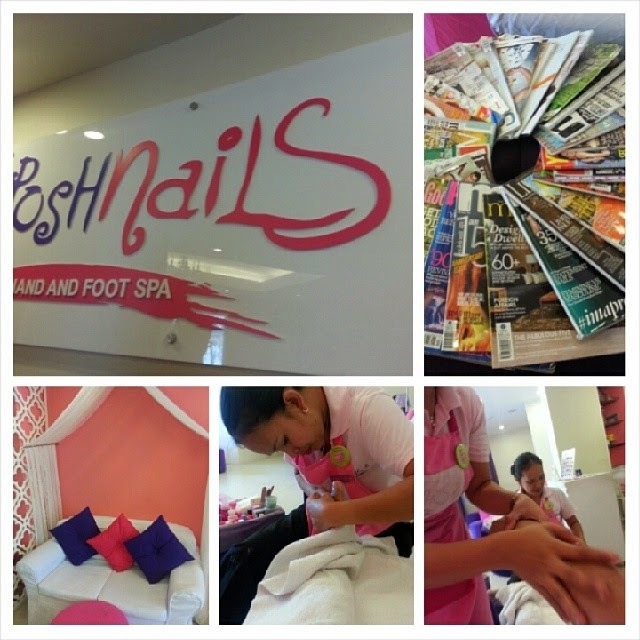 This new franchise of Posh Nails at Greenhills offers all the Posh Nails services; Posh Grooming (Manicure and Pedicure), Posh Spoiling (soak, spa, scrub, manicure or pedicure, massage 10mins), waxing, nail art, massage, foot spa, eyelash extensions, paraffin and other relaxing beauty services every girl wants today. The rates of services are actually affordable similar to most nearby salons in your neighborhood. Do not be intimidated by the ambiance because Posh Nails is cheap despite the Anne Curtis and other celebrity endorsing the brand. 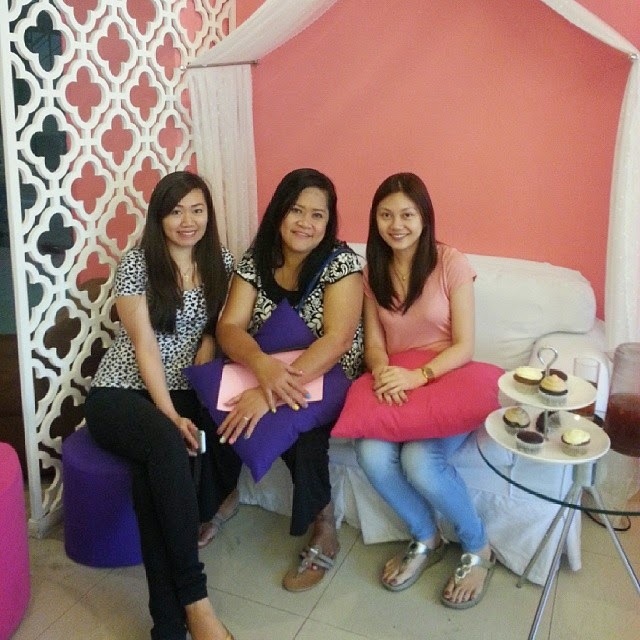 It is not expensive to get poshed so visit these friendly and gorgeous ladies at Posh Nails Greenhills. 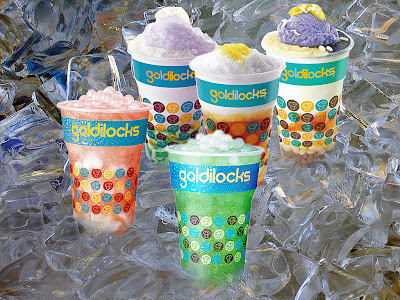 Visit the 2nd floor of Fox Square Building, Connecticut St. Greenhills. Call 496-8713/09179633609 for sparties, birthdays, anniversaries, debuts and all occasions reservation. For more info, visit www.poshnails.com.ph, like also their official Facebook Page at https://www.facebook.com/pages/Posh-Nails-Greenhills and follow @poshnailsgh on Instagram for more promos and updates.